Feijoada is perhaps the most famous Brazilian dish, one that's eaten by Brazilians young and old, rich and poor, from north to south. It's a dish enjoyed on special occasions and by family members as a slow feast to unwind on weekends. 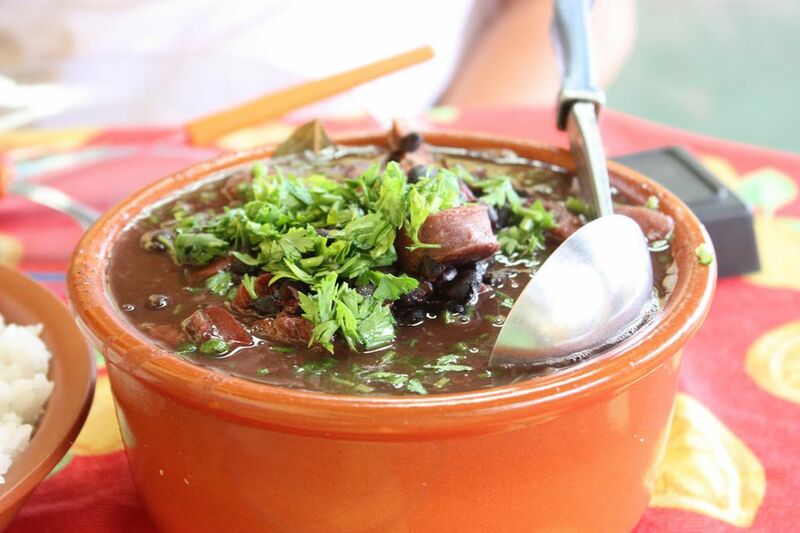 The typical feijoada from Rio de Janeiro is made with black beans and is usually enjoyed as a late lunch on Saturdays, often with live samba music. Feijoada is a meal that includes the following components: black beans stewed with meat, especially pork sausage, ribs, and dried beef; white rice; collard greens; farofa, ground manioc with herbs and small chunks of dried meat, which provides a contrasting texture to the bean stew; orange slices; and sometimes fried bananas. Another addition to the typical feijoada feast is a caipirinha, the famous Brazilian drink made with cachaça (a liquor made from sugarcane), lime and sugar. Consider the similar caipiroska, made with vodka and fruit (usually lime or even strawberry). Other popular cocktails include batidas, cocktail made by shaking or mixing the drink. A Brazilian favorite is the batida de maracujá, made with passionfruit juice, condensed milk, and vodka. Eating at a churrascaria is a must when visiting Brazil, and Rio de Janeiro has some of the country's best churrascarias, including Porcão in the neighborhood of Flamengo and Churrascaria Palace, an old local favorite, in Copacabana. These all-you-can-eat barbecue restaurants serve a variety of appetizers, hot and cold dishes served buffet style, and freshly barbecued meat that's sliced to your liking at the table. Servers rotate through the restaurant with a constantly changing selection of meats, so if you don't see what you'd like the first time someone stops by, wait for the next one. Be sure to try the favorite cut of beef, picanha (the "rump cap" cut of the tri-tip), as well as grilled pineapple and fresh fish. Água de coco is coconut water that's drunk with a straw out of a freshly-opened green coconut. Because of the hydrating and health properties of coconut, this is a popular drink in the beach culture of Brazil. Água de coco vendors line the beaches of Rio de Janeiro. After ordering, the vendor will chop the top of the coconut off and hand it to you with a straw, but after drinking, you can ask to have it opened so that you can scrape out the sweet coconut meat. With hundreds of different possibilities, ordering juice in Brazil is quite an experience. Juice bars abound in Rio de Janeiro, but you can also find a good selection at most restaurants and botecos (local bars that serve drinks, food, and juices). Try these local favorite juices: suco de laranja com acerola (orange juice with the Vitamin-C packed fruit acerola), suco de abacaxi com hortelã (pineapple juice with mint), and suco de cajú (cashew fruit juice). Typical Brazilian desserts like quindim (a rich pastry made with egg yolks and sugar), brigadeiro, and mousse de maracujá (passionfruit mousse) are served in cafes across Rio de Janeiro. Try Confeitaria Colombo, a beautiful grand cafe with a stained glass ceiling and Art Deco details, where pastries and tarts are served with coffee. Brazil has a rich street food culture that includes a variety of tasty foods that reflect the country's diverse cuisine. Street food in Brazil makes an easy, cheap meal or snack. Coxinhas: (pictured) pear-shaped fried fritters with slightly spicy shredded chicken inside.